I am once again writing about some great hangover food. 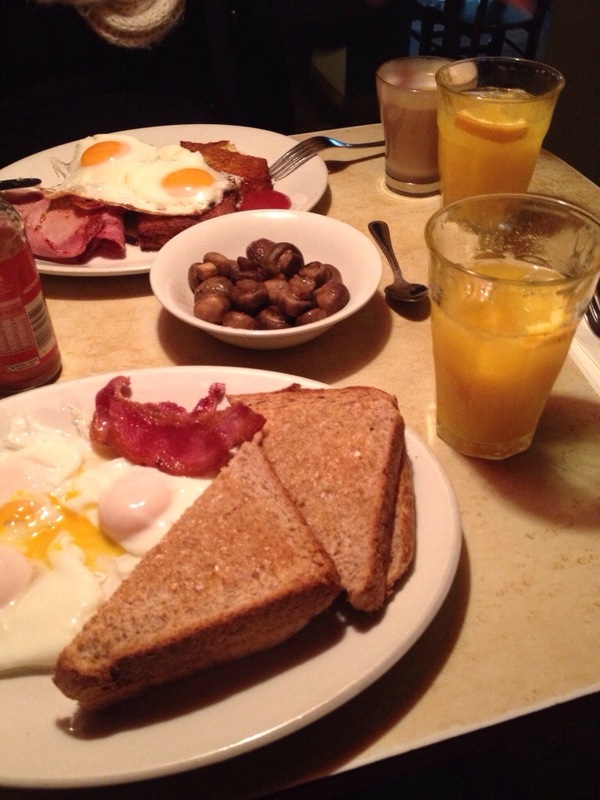 Breakfast at Banners in Crouch End. Friday night we attempted to venture out to Shoreditch. A little too drunk, and too impatient to wait in long queues I can say it wasn’t a particularly successful night out. Although very funny, and perhaps slightly worth the hangover I was dealing with Saturday morning. 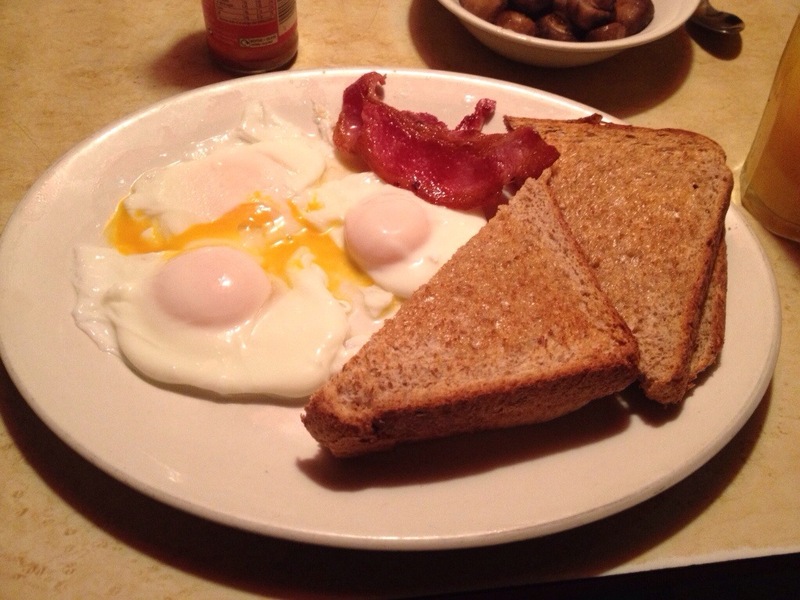 To make it up to my weekend visitor – Charley – I decided to take her out for breakfast. I had always been recommended Banners by others, as it was walking distance from home and I was told the food was amazing. So I decided we could take a stroll, get some morning fresh air and go cure our hangovers. Note : Do ring to book in advance – I did check the website so did do this. When we got there we were seated on a cute little table, up on a raised platform close to the kitchen. And given two menus. Photo taken after we’d eaten – getting my priorities right: feed my empty tummy first! 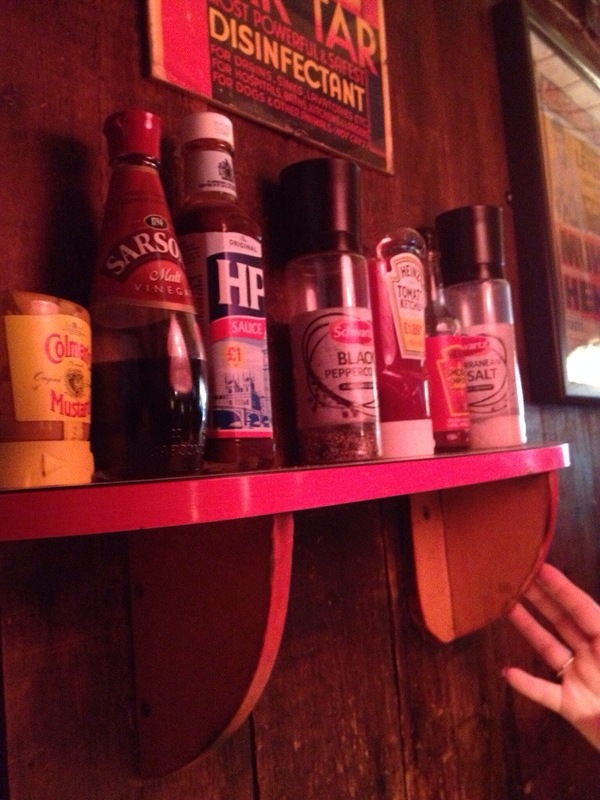 The shelf above the table – We both quite liked this. Kept the sauces out the way too! 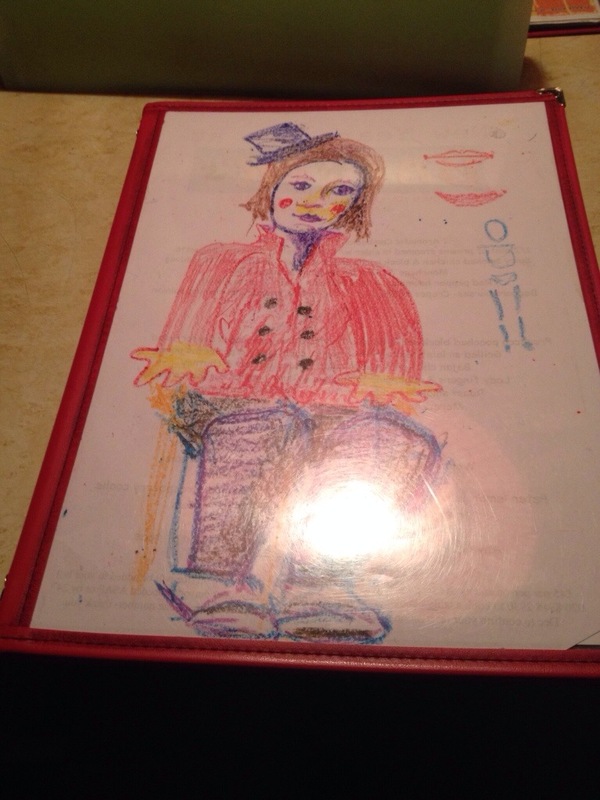 This is what the menus look like – little hand-drawn pics on the front. 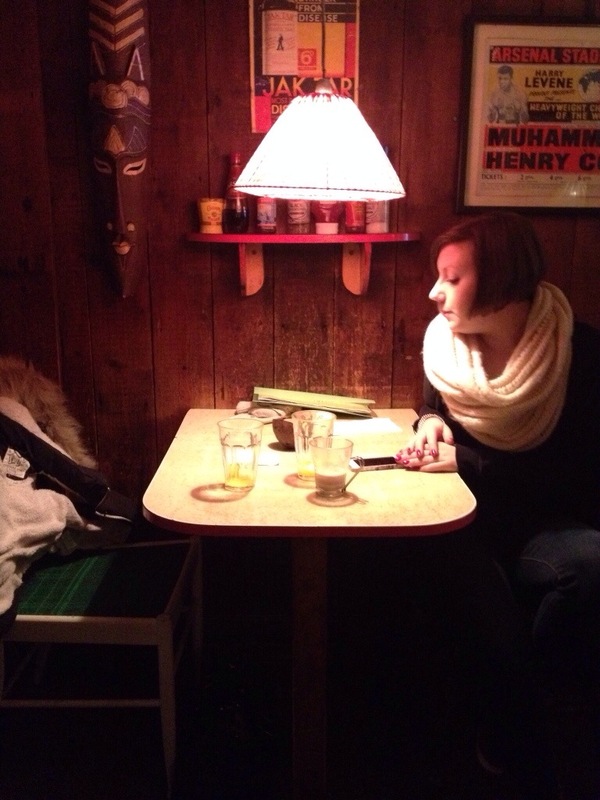 The waitress soon came back to take a drinks order. 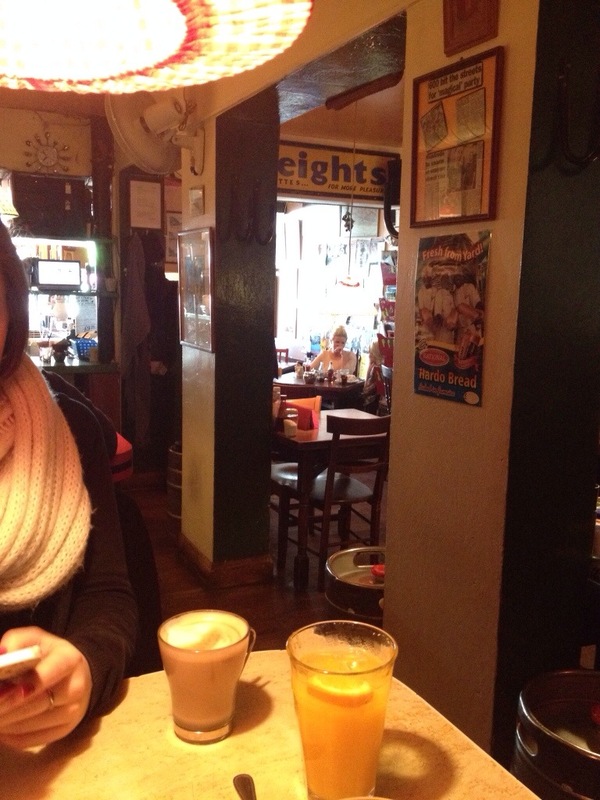 Both ordering orange juice – freshly squeezed at Banners! Plus Charley had a Latte which she said was so good it didn’t even need sugar. There were so many choices on the menu – Jamaican breakfast, pancakes, yoghurt, toast, scrambled eggs with chorizo and cheese..it was so difficult to choose. Charley went for hash browns which came homemade (3 of them – they were huge but looked so tasty), fried eggs and bacon. I had poached eggs on brown toast, with a side order of mushrooms..and I did have a little of Charley’s bacon. Food came out pretty quickly. There was SO much food! And we were told these were the smaller dishes! As we were eating we were looking around the restaurant. Lots of quirky items hung on the walls like tribal masks, the walls were plastered with posters and film pictures, one of the benches charley even noticed was actually a church pew. It was so cool inside, and everyone seemed to be enjoying their breakfast. The food was amazing! It was so delicious it was a shame we couldn’t manage it all as such big portions. And I only spent £20 altogether for both of us. Bargain! 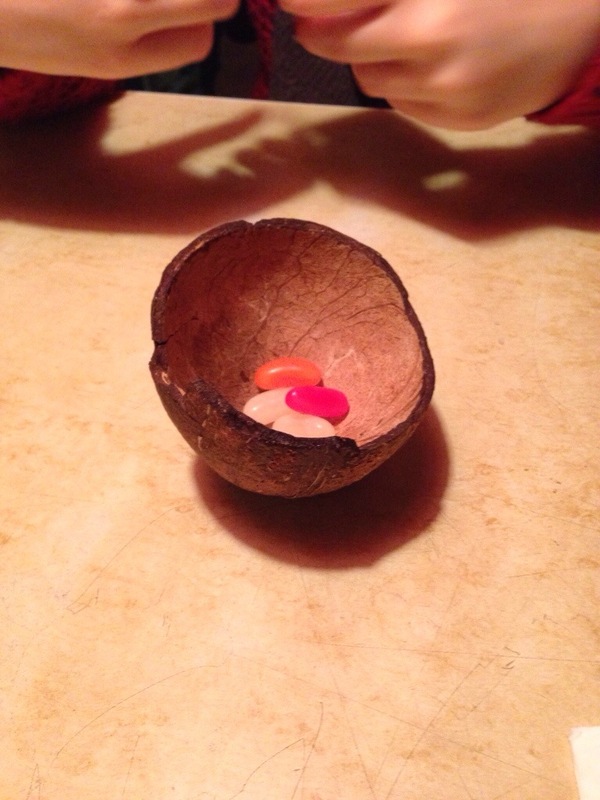 The bill came out in half a coconut shell with some jelly beans which I thought was a nice little touch. We didn’t feel rushed even though we knew we only had the table for an hour, perhaps because the service was so quick and friendly. But it does get super busy! Obviously a popular place among the locals. I’ll definitely be returning here again. Great food and service. Perhaps I’ll go back for dinner next time so i can try something different – the main menu looks just as good!